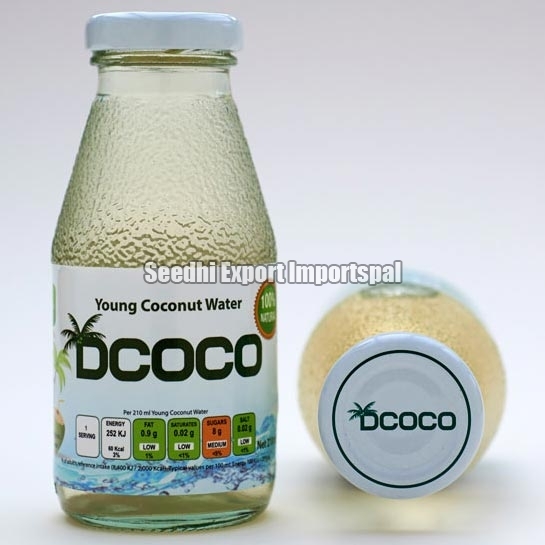 Seedhi Export Importspal is a dependable Exporter, Importer, and Supplier of Coconut Water. We offer Coconut Water of Dococo brand, which is 100% natural young coconut water of pristine quality and taste from Sri Lanka. It is extracted from King Coconuts, purely cultivated for drinking coconut water. Dococo has immense experience in picking the premium young coconuts from the farms and the community plantations. These handpicked young coconuts are washed, extracted for water, carefully treated, and then packed in food grade glass bottles for DCOCO. Being low in calories and having more potassium than a banana, DCOCO boosts the metabolism and thus promotes weight loss. Being a good source of Cytokinins, young coconut water produces an anti-aging effect on the body. Western world is valuing DCOCO for its pristine quality, taste and health promoting properties. DCOCO bottles, lids and packing are recyclable. DCOCO is UK’s first 100% natural young coconut water in 210ml glass bottles and has more Vitamin C than orange juice. DCOCO, powered by its natural goodness, is nature’s sports drink. DCOCO is rich in essential electrolytes (potassium, magnesium, calcium, phosphorus, sodium) and has no artificial colors, no artificial flavors, no preservatives and no added sugar. DCOCO is not from concentrate. It is an all in one isotonic beverage.